Learn how to play guitar chords using your iPhone. 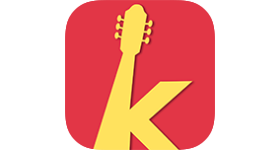 The first of a kind application was created based on years of experience teaching kids how to play the basic guitar chords. Each chord is represented by special symbol and animal, assisting children to remember how to hold the guitar. Learning how to play guitar was never such fun… go from being a Noobie until you master and become the King of the Riff.